The fast answer is Exercise Pro Live has more features, better customer support and over 20 years of reliability and trust. Following is detailed information for Hep2go compared to Exercise Pro Live. Here is a quick summary of 20 facts. Each item mentioned is a basic feature of Exercise Pro Live but is lacking in Hep2go. Not all exercises have video. It’s true; in fact most of the exercises on hep2go do not have video. 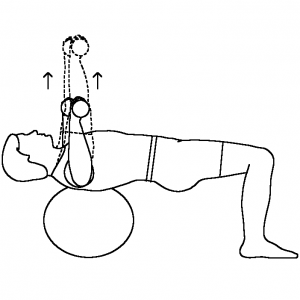 This decreases the effectiveness of demonstrating proper form and technique to patients. No line art pictures for exercises. Exercise Pro Live provides both photos and line art. Why? It can save significant ink and toner costs. That is important to both patients and clinics – and it is more environmentally friendly. No control over names of exercises. Names of exercises are crucial when searching. Not having the ability to modify an exercise name means you are stuck with what someone else named it. No exercise defaults. 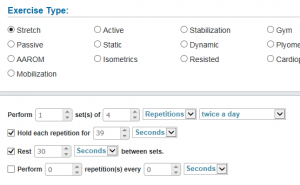 Hep2go makes you enter the exercise information each time, like sets, reps, times per week. Exercise Pro Live lets you set defaults based on a variety of exercise types. The result is more time saving and less frustration. No metric setting and no way to enter amount of weight or color of elastic. Much of the world is metric. Forcing metric users to use English measures is just not user friendly. And not allowing the clinician to enter the amount of weight or color of a resistance band opens the door for a patient to use the wrong weight, potentially increasing the chance of injury. No means to set exercise frequency to specific days or times per week. Exercise Pro Live lets the clinician choose M-W-F or Tues/Thurs, every 2 hours and other detailed settings. Hep2go only lets you choose per day or per week. No language options. 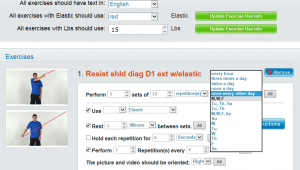 Exercise Pro Live has the option to print with Spanish or French. Programs like hep2go that use a generic web translator system are subject to wrong words, incorrect phrasing and other miscommunication errors. Anyone that has used these “universal” translators knows what we are talking about. Community added content concerns. Allowing anyone to add any content they want creates 3 issues. First, professional consistency of photos and video drops. You can end up with poor quality, poor technique, and distracting backgrounds. Second, the library becomes cluttered with duplicate exercises, often resulting in hundreds of variations of the same thing. This makes locating content extremely cumbersome and time consuming. Third, it is impossible to know if the person posting has a legal model release from the person in the photo. If they don’t, that person has the right to file lawsuits for using their image in a for profit business without permission. Limited to only two templates or protocols. Hep2go hinders ease of use with this restriction. Easy to see why this is no good. No business logo. Not only is it no logo, but you must have their company logo. Only two search methods. Exercise Pro Live has five different search options, so you are guaranteed to find the one that works for you. No phone support. Exercise Pro Live offer complete phone support and even online training. No means to share patient information with other clinicians in the same company. This creates problems when one clinician covers for another and needs to see the home program history. No group send feature. Sending one program to a group is a great feature, especially for group training classes. And it is included in Exercise Pro Live. No video tutorials. This speaks for itself. No patient name. Best Practice standards dictate that everything provided to a patient must have their name on it (and the therapist name) in order to comply with proper and legal documentation expectation. Additionally, HIPAA guidelines indicate that even without a name, information given to a patient is considered confidential patient information. No compliance monitor feature. Hep2go has no way for the therapist to check and see how often the patient views their program. And no pain or difficulty feedback and adherence feature. EPL lets your patient provide feedback on pain and difficulty. Inability to have a program expire after a set time. By not automatically setting a time limit on a home program link, your rehabilitation programs are wandering around the internet forever, for anyone to see. No EMR link capability. Exercise Pro Live links with almost any medical records program. Since hep2go captures no patient name this is not possible. This means more documentation time required. No communication portal. Exercise Pro Live has a feedback and communication text portal built in. Improving communication is crucial with home programs. EPL has a Rewards program, further encouraging patients to stay on track and maintaining responsibility for their treatment. Hep2go does not. EPL offer a Net Promoter Score feature so you get immediate feedback on how patients perceive your quality of care. Hep2go does not. Final thoughts related to Hep2go compared to Exercise Pro Live. The free version of Hep2Go also contains ads. If you pay the five dollar monthly fee ($4.95) what does that get you? For the most part moving to the paid option gives the user only a logo, the ability to create more than two protocols, and a bit of control over who sees public community content. When you look at pricing of Hep2go compared to Exercise Pro Live, the difference is only about the cost of a cup of coffee. Exercise Pro Live can even be less if your facility has more than one clinician. It just makes sense to go with a full featured professional system.